I find the power of the internet to be amazing. Last year due to a guest post on a friend's blog, I learned of the debut novel Mother of the Believers by Kamran Pasha. I enjoyed reading it, and posted my review on this blog. A few weeks later, a publicist at Simon and Schuster emailed me and wanted to know if I would be interested in a review copy for another debut novelist. I gave her my mailing address and over the last year I have periodically received novels from different Simon and Schuster publicists, mostly in the historical fiction genre. Some I have read and blogged about, others I have not. The most recent book I received was a follow up novel by Kamran Pasha titled Shadow of the Swords. I remembered from his author notes in Mother of the Believers that he was working on a novel about the Crusades. I would have bought this book on my own, but was delighted when I received a free copy prior to its official publication date. On the publicity materials was a mention that he was available for interviews. After I finished reading the book, I contacted the publicist to see how I could interview him. I expected that I would be emailing him questions, but I was surprised to learn I could speak with him by phone. After a few attempts at finding a mutually convenient time, Kamran and I spoke by Skype on the morning his book was released to the public. I owe having that opportunity to the power of the internet. “(T)he rabbi knew that the marauders had ceased to think in terms of God or religion. They were like men possessed, driven by their own fears of death to kill…It was not about right or wrong, or the well-considered arguments of religious scholars. Terror was its own kind of madness and no reason, no faith, could shine a light into that darkest region of the human soul.” – Kamran Pasha, Shadow of the Swords, p. 239. That madness is religious zealotry. It does not matter the faith of the zealot, because it is the fear and the fervor that overpowers the mind and allows atrocities to occur in the name of God. One of the most notorious examples of this kind of faith-based zealotry was during the Crusades. The listing of atrocities perpetrated by Our Enemies that justified the actions by Our Heroes. This entrenched mindset perpetuates itself in every new generation even though the Crusades began nearly a thousand years ago and those involved in the military campaigns have long ago been reduced to skeletons. The cultural wounds inflicted by these multiple wars between Christians and Muslims continue to cast long shadows over today's international politics. Kamran Pasha’s new novel, Shadow of the Swords, was inspired in reaction to the horrific events of September 11, 2001. As an American Muslim, he not only felt devastated by the human tragedy, but he felt an additional burden of knowing that the culprits of those crimes claimed to be acting on behalf of his faith. He knew the terrorists' beliefs were a perversion of Islam and recognized the attacks would fan the smoldering flames of conflict between Christians and Muslims. As a lifelong student of history and religion, Pasha wanted to write a story examining the roots of the animosity between Christianity and Islam. He chose the time period of the Third Crusade led by the iconic figures of King Richard the Lionheart on the Christian side and Sultan Saladin on the Muslim side. Pasha breaks the age-old Good vs. Evil dichotomy by utilizing multiple viewpoints demonstrating that everyone sees themselves as hero in their own life story. Even if they commit atrocities, they will justify their acts under the guise of heroism. The historical figure of Saladin is revered by Muslims and respected by Christians for his uncommon acts of chivalry, some of which are depicted in this novel. Two examples: sending his own physician to treat King Richard, who was dying from an illness; offering his own horse as a replacement when King Richard’s horse was killed on the battlefield. Whereas, while King Richard the Lionheart has a legendary mystique about him, enhanced by tales of Robin Hood when he was away on Crusade, the historic figure is less sympathetic. To counterbalance this, Pasha created the character of Sir William Chinon to depict the chivalric ideal to carry the standard for the Christians. Pasha was not content with just showing the epic scope of the battles led by Saladin and King Richard the Lionheart, he also examines the perspective of Jews in the Levant at the time and their relationship with Muslims and Christians. The historical figure of Maimonides, a rabbi and physician to Saladin, is featured prominently as well as the character of Miriam, an educated and high-spirited Jewish woman. Miriam serves the dramatic function of interacting with both Saladin and King Richard and allows the readers to see them as human beings and not icons of legend. It is the intersection of the three great faiths of Judaism, Christianity and Islam that gives the novel its strength and heart. To understand where we are going, it is important to know where we came from. There is a lot of commonality in the Judeo-Christian-Islamic religious traditions, hopefully Shadow of the Swords will help readers focus on those unifying areas more than the differences which divides us. Edited to add: I had intended on writing a summary of the discussion I had with Kamran. My digital recorder started giving me fits. Modern technology can be a wonderful thing, until it has develops a mind of its own. 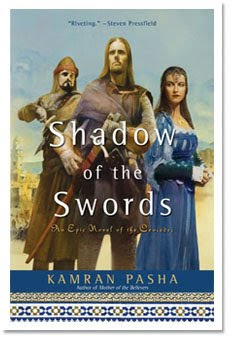 I discovered a website that has an online podcast interview of Kamran Pasha discussing Shadow of the Swords. Check it out on writerscast.com . Interesting review. You have a wide range of interests in reading, and more power to you for that. Thank you. It took a little editing, but I was able to embed a link to the end of my blog post per your request. I hope that made things easier for you. 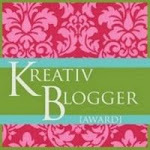 And thank you for letting me know about one of my reviews being posted on your blog. Let me know how I can help facilitate your postings of my reviews in the future.